What to look for in a camping pillow? Game-changing outdoor products very, very rarely measure in at a mere 3 by 3 inches and weigh in at a tiny 2.8 ounces, but in the Sea to Summit Aero we find an outstandingly practical and high-performing exception to the rule. This pillow is an absolute dream for the gram-counter, ultralight minimalist, and comfort-seeker alike, and without a doubt the best backpacking pillow we’ve ever had the pleasure of laying our heads on. In addition to its tiny pack size and featherlight weight, this pillow is a marvel of convenience, blowing up with just a couple of large puffs and featuring an adjustment button that allows you to find the ideal level of inflation for your sleeping style. Where this one truly wins out over its competitors, however, is in the comfort and quality stakes. The Aeros sandwiches a thin but very effective layer of protective synthetic fill between a tough but supple TPU bladder and a superbly soft, 50-denier knitted polyester exterior, all of which combine to make this one of the softest and most puncture-resistant pillows out there. Just as importantly, the height of the pillow and slightly cambered shape mean the pillow cradles your head, making it ideal for side-sleepers, back-sleepers, and front-sleepers alike. While the price of the Aeros may put off many potential buyers, given the quality of the materials used and S2S’s lifetime warranty, it’s kinda hard to go wrong. Supposing you use the pillow just 50 times in your lifetime, that works out at a matter of cents per good night’s sleep. 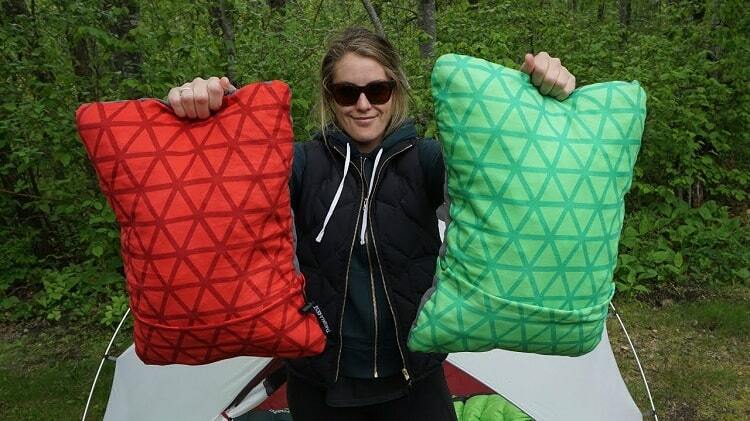 There are plenty of cheaper camping pillows on the market, but we believe in the simple dictum “buy well, buy once”, and any buyer of the S2S Aeros, for our money, is buying as well as is currently possible for anyone looking for the perfect blend of portability, comfort, practicality, and overall quality. The S2S Aeros is a hard act to follow, but in the Nemo Fillo the Aeros finds a very worthy competitor that may even prove to be more appealing to some would-be buyers. The Nemo Fillo features a hybrid design that uses a combo of air, foam, and a microsuede cover to deliver a pillow that’s simply a dream for your dome. With five inches of loft from the super-soft foam fill and the lush texture of that microsuede cover, this is a pillow that takes your comfort seriously. At 0.85 pounds, this isn’t the lightest pillow in our review and probably isn’t the best option for long-distance backpacking trips. However, compared to other pillows that prioritize comfort over portability and packability it is, relatively speaking, at the lighter end of the scale. As such, this represents a happy medium between ultralight models like the Aeros (above) and the Thermarest Travel Pillow (below). It’s pricey, granted, but in return for that additional outlay you get a pillow that’s built to last and backed by a limited lifetime warranty from the manufacturer. If buying this pillow, be aware that it must be stored out of the stuff sack, otherwise the foam fill loses loft and shape over time. More than any other pillow in our review, this one replicates the feel of our pillow at home thanks to its plush, brushed polyester cover and plump, four-inch urethane fill. While some potential buyers may be tempted to focus on the less endearing specification listed in this one’s product description—that is, the fairly hefty 12 oz weight—this pillow wins our vote on account of not only its undoubted quality but also its generosity as regards quantity. At 16 by 23 by 4 inches, with this pillow you get a lot of loft, length, and breadth for your buck. Those dimensions, in combination with the superbly soft foam fill and that brushed cover, bring a pillow that offers oodles of comfort and neck support and plenty of leeway for those prone to tossing and turning in their sleep. Other than the weight and lack of packability, it’s very hard to find fault with the Thermarest Travel Pillow. It’s reasonably priced, well made, durable, machine washable, and just about as comfortable as they come, all of which make it just about the ideal choice for anyone not venturing too far on the trails before bedtime. 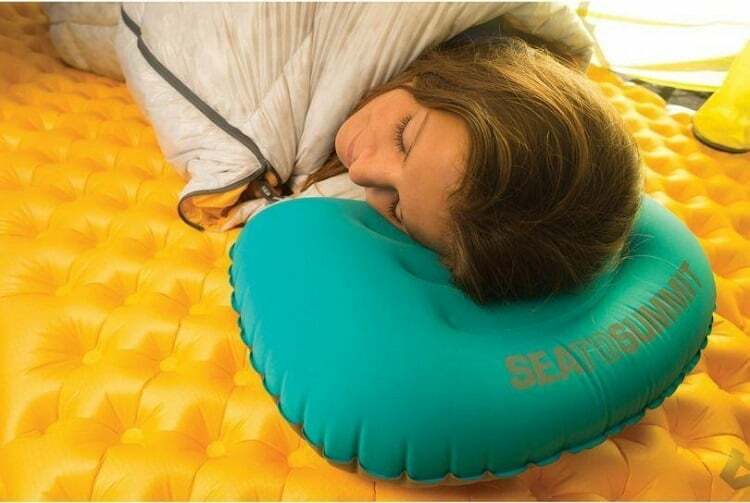 This might not be the ideal pillow for long-distance backpacking owing to its ever so slightly ponderous weight, but for car camping or single overnighters in the backcountry, there are few, if any, more comfortable pillows out there. If your list of priorities places comfort, support, and all-around luxuriousness above packability and portability, this may well be the pillow for you. 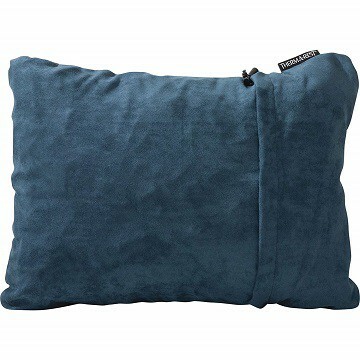 Using a memory foam fill in combination with a machine-washable, thermo-regulating, and wonderfully soft polyester and viscose rayon cover, this pillow oozes quality, coziness, and comfort from the second you get your hands on it. And when you finally get the chance to lay your head on it, it performs none too shabbily, either…! Weighing in at a hefty 36 ounces and measuring 10 by 6 inches when compressed, this pillow is unlikely to gain too many fans from the gram-counting or ultralight community. However, we can only judge the merit of any given product using the parameters of its specific category or niche—we would, after all, hardly lament a lack of easy parking ability or favorable miles-to-the-gallon ratio when buying a beast of a utility vehicle, would we? Being a pillow that belongs very much to the big and beautiful class of camping pillows, the metrics by which we can fairly measure this option’s worth are comfort, support, and ability to provide a good night’s sleep, and in all three of these aspects it delivers as well as any travel pillow or camping pillow we know. As with the Thermarest Compressible Travel Pillow, this one isn’t going to win any awards for portability, but in terms of comfort and luxuriousness, it’s as good as any camping pillow we’ve ever come across. Let’s get straight to the bottom line: the Trekology Inflating Travel Pillow is an ultralight backpacking pillow that ticks all the boxes we could possibly wish to have ticked and still costs less than half of many of its lightweight competitors. Well, it’s about to sound a whole lot better. This dead-ringer for the S2S Aeros (see above) is not only cheap, but boasts the kind of specs that will make anyone undecided about whether or not a backpacking pillow is worth space in their pack reconsider in a hurry. Weighing in a tiny 2.75 ounces and packing down to just 5 by 2.5 inches, this is the most portable pillow in our review. It also delivers surprisingly well in terms of quality, too—using a water-resistant polyester-TPU blend that’s more than strong enough to deal with the odd poke from other items in your pack or scuffs from abrasive rocks, trees, dirt, or whatever other inanimate aggressors it may come into contact with. Compared to the S2S Aeros, this pillow lacks a little in the way of durability and doesn’t have the same soft material on the pillow’s exterior, but given that it costs just a fraction of the price, these flaws are very forgivable. While this pillow represents great value for money and is, to our mind, undoubtedly the best cheap camping pillow out there, it lacks the long-term durability of some of the pricier models featured above. An oft-quoted saying tells us that home is wherever we hang our hat. Those of us who’ve spent any length of time camping in the outdoors, however, know that home can just as well be wherever we happen to lay our heads, be it on some snow-bound slope in the mountains, in the middle of a barren desert, on a forest floor, or even on a tiny portaledge halfway up a huge vertical cliff. Often, however, even when we’ve chosen our camping location very carefully, there are a number of variables that make that place we’re laying our heads a little less “homely” than we’d like. Lumpy sleeping bag hoods, ill-made improvised pillows, rocks beneath our tent, and uneven terrain are just a few of the potential variables that can get in the way of us getting a good night’s sleep. Thankfully, the solution to such problems is very easily come by, very small, and very affordable—the camping pillow. Once frowned upon by old-school outdoors-goers as a gratuitous excess favored only by over-delicate city folk, camping pillows now have the approval of countless hardened campers on their side thanks to technological advances that have made them smaller, lighter, and more comfortable than ever before, making them an all but indispensable component of any serious camper’s kit. While the size of your pillow is important for storage reasons, its dimensions also play a big part in its overall usefulness and appeal as regards comfort. While a tiny pillow may take up less pack space, after maybe the tenth time your head has slipped off it during the night you’re sure to start wondering if you wouldn’t have been better off leaving it at home and using your jacket or stuff sack instead—or, more likely, investing in a slightly bulkier but far more comfortable pillow that earns its place in your pack by doing the job you brought it along to do. 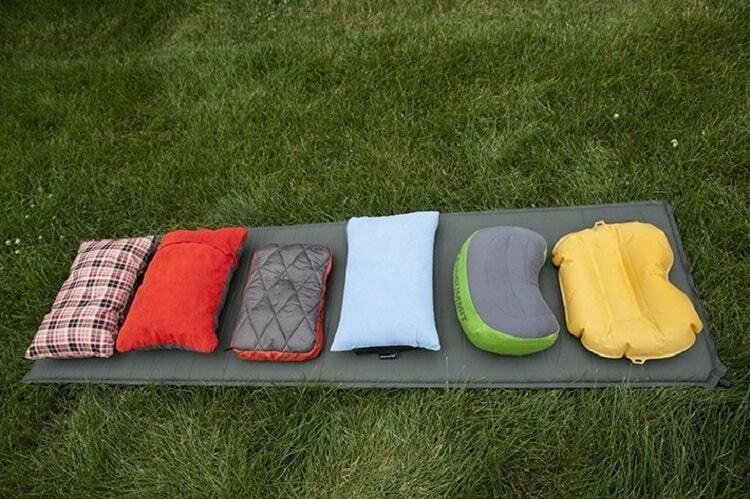 The material used in your camping pillow is important for two reasons: durability and comfort. With regard to comfort, the general rule is that compressible models are superior to inflatable models, but as a result usually lose a lot in the way of portability. While comfort is a very personal and subjective metric to measure, the air chamber in inflatable models often has a tendency to feel a touch on the hard side when fully inflated and most inflatable models also lack a detachable, soft cover. The obvious drawback and trade-off here is with pack size, with inflatable models being more pocketable instead of simply packable and compressible models (that use foam, down, or synthetic fills) usually weighing a lot more and being far bulkier. 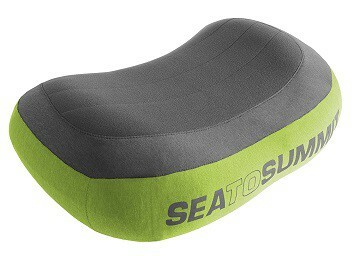 For a happy medium that offers the best of both worlds, hybrid models are often the way to go, with pillows like the S2S Aeros featured above delivering on both the packability and the comfort front by using a combination of air (inflation) and a thin layer of foam or other synthetic materials to boost comfort. Although not featured in our review, one other option as regards fill material is down, which is generally regarded as one of the most comfortable lightweight materials out there. One point worth noting with regard to down pillows, however, is that although they are super soft and more compressible than most foam models, if you happen to get them wet they can take a small age to dry out—not ideal if you’re at the start of your backpacking trip as opposed to the end! When we’re backpacking, more often than not every inch of space in our pack is prized real estate. As such, any gear items that can be scrunched down to a tiny bundle are something of a blessing. As a luxury item (i.e. one we could survive without), a camping pillow that doesn’t compress and thus takes up too much pack space is likely to be one we’ll leave behind when push comes to shove and we’re finalizing our packing. The support provided by your pillow is crucial to ensuring you don’t wake up with any nasty cricks, strains, or stiffness in your neck and upper back. Support can be quantified by the amount of loft any pillow provides (usually measured in inches) and the type of materials used in its construction. In light of the above, when surveying the specs of any pillow, pay particular attention to the fill type and the depth of the pillow, which is always the smallest of the three figures quoted in the product’s dimensions. For most sleepers, a pillow with 4 or 5 inches of girth will prove to be most closely resemble their pillow at home, with a few slight variations depending on how you sleep. For side sleepers, a thicker pillow is usually required to keep the spine safely and comfortably aligned, whereas stomach sleepers require much less support and usually feel more comfortable will as little as 2/3 inches of loft. Back sleepers ordinarily fall somewhere in the middle, with 4 inches usually the ideal amount of loft for most users. With regard to materials, it’s important to note that most inflatable models will retain their loft—and, thus, their support—throughout the night, whereas foam, synthetic, or down pillows will lose at least little loft owing to the pressure applied upon them by the weight of your head. For durability, look for ripstop materials and, in inflatable models, supple but robust rubber or thermoplastic polyurethane (TPU). Sometimes, gauging how durable a pillow will be isn’t easily done, particularly if shopping online and relying solely on the manufacturer’s often inflated (no pun intended!) boasts and claims about their product (“highly durable”, “built to last”, and so on). This being so, the best way to get a handle on how your pillow will perform in the long run is to get your Sherlock Holmes on and do a little digging. Head online, locate the user reviews, and hunt down any posted by users after a significant period of use to see how the pillow stood up to the test of time. Finally, never buy a pillow without a substantial warranty period. Most reputable sellers offer a lifetime warranty, so if your pillow’s manufacturer is offering anything less than 5 years, raise a wary eyebrow, ask yourself why, and seriously consider taking your money elsewhere. Why do you need a camping pillow? Let’s start with the bald-faced fact of the matter: you don’t. A camping pillow is a luxury item that many a camper has gone without over the years and many will go without for many yet to come. A very stiff neck after a night’s camping (and perhaps each and every night’s camping). Sleepless nights spent fighting and fiddling with bundles of usually smelly hiking clothing trying to fashion an improvised pillow. Many frustrating minutes wasted trying to fill a stuff sack with the appropriate amount of clothing to make a makeshift pillow that has the ideal loft. Envy at their pillow-carrying campmates. One of the few downsides to spending our nights in the great outdoors is the lack of a few home comforts that would make the experience all the more enjoyable and, for some, just plain tolerable. Given that a great camping pillow that offers almost the same comfort levels as your pillow at home might cost you little more than a 12-pack of beer, take up less room in your pack than a single can out of that 12-pack, and make the difference between a good night’s sleep and no sleep whatsoever, therefore, the decision to bring a camping pillow along with you on your adventures is really a no-brainer. There are, moreover a number of health-related reasons in favor of using a good pillow and, even for those of us less endeared by the wisdom emanating from the medical community, there can be no doubting that the knock-on effects of a bad night’s sleep—fatigue, crankiness, less than peak performance in our chosen outdoors activities—are all things well worth avoiding. How do you wash a camping pillow? The way in which you wash your camping pillow will be determined by the materials with which it is made. For down varieties, this may mean using a special down wash detergent which will restore a little “loft” to the down filling at the same time as laundering the pillow’s interior and exterior. With inflatable pillows, hand washing and air drying is the only way to go. This can be done by first closing the valve to ensure that water doesn’t enter the bladder while washing. Then, using regular laundry detergent or soap, dunk the pillow in lukewarm water and scrub the exterior with your hands. Because facial oils and grease can be fairly stubborn and soak into the fabric, you may have to repeat the process a couple of times before drying on the line or inside at room temperature (not on a radiator). What’s the difference between camping pillows and travel pillows? To the untrained eye, the differences between camping pillows and travel pillows may seem altogether negligible. However, each pillow type has design features and characteristics that make it dialed into its anticipated use. For the most part, the two types of pillow can be distinguished by their packability. 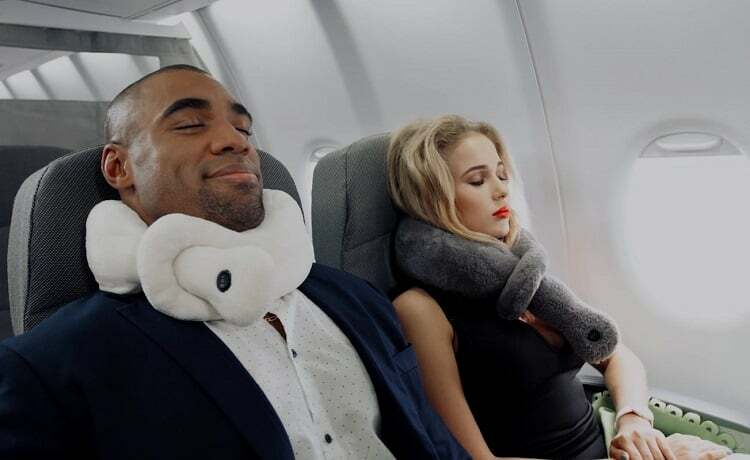 Because not intended to be carried long distances, travel pillows, generally speaking, are much heavier and bulkier than their camping counterparts and far more inflatable models are considered genuine camping pillows than heavier compressible varieties of pillow that use foam, down, or synthetic fills. A good camping pillow can not only prove to be the difference between a good night’s sleep and a bad one, but also help you avoid all of the potential knock-on effects a sketchy night’s sleep can bring—fatigue, irritability, and a general lack of enjoyment the following day. 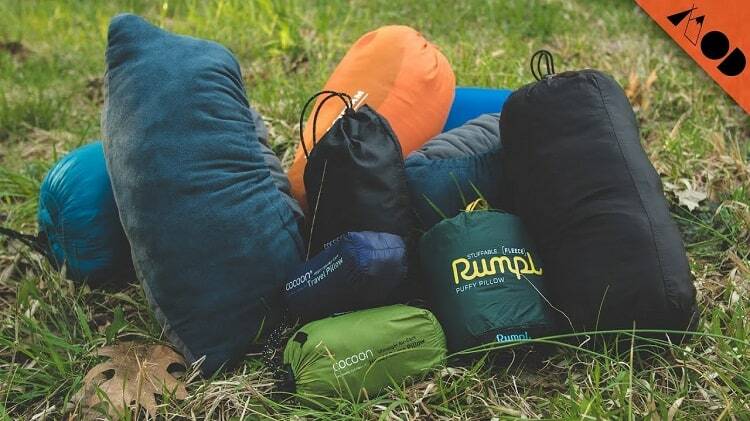 Most happy campers we know are all of the opinion that their camping pillow is worth its weight in gold, and we’ll sure you’ll feel likewise if you give any of the above options a try. The model that will be best for you will ultimately come down to personal preferences, sleeping style, and your own MO in the outdoors (ultralight enthusiast or carefree carrier of every convenience in you can squeeze in your pack), but should it happen to be any of those featured above, we’re sure you’ll be on your way to many happier sleeps in the outdoors on your forthcoming adventures.